Do not adjust the steering wheel while driving. You could lose control of your vehicle and cause an accident. Do not adjust the steering wheel any closer to you than is necessary for proper steering operation and comfort. The driver’s air bag inflates with great force. If you are unrestrained, leaning forward, sitting sideways or out of position in any way, you are at greater risk of injury or death in a crash. You may also receive serious or fatal injuries from the air bag if you are up against it when it inflates. Always sit back against the seatback and as far away as practical from the steering wheel. Always use the seat belts. Adjust the steering wheel forward or backward in direction 3 to the desired position. 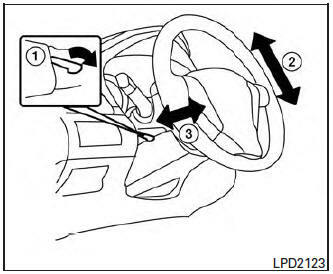 Adjust the steering wheel up or down in direction 2 to the desired position. Push the lock lever 1 up firmly to lock the steering wheel in place.